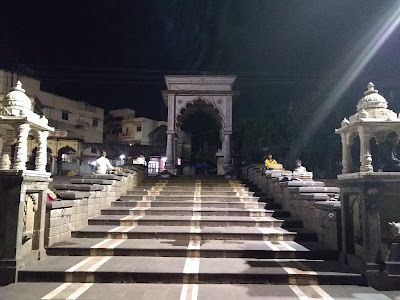 Alandi is well known as the residence and final resting place of Sant Dnyaneshwar - one of the most important figures of the Warkari sect and one of the principle saints of Maharashtra. The town is thus a major place of pilgrimage in the state. The town lies just to the north of Pune city, on the banks of the Indrayani river which it straddles with immense bathing ghats. 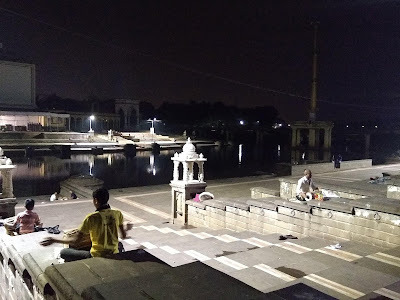 I have been meaning to visit Alandi for a long time, but for one reason or the other, that never happened. Until this time. 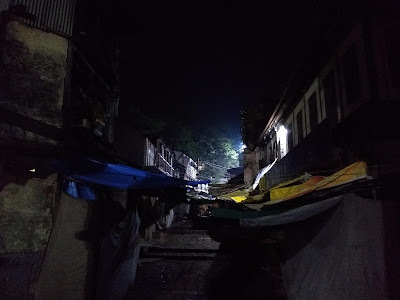 On a midnight drive to a place further north from Pune, we passed through the town of Alandi. 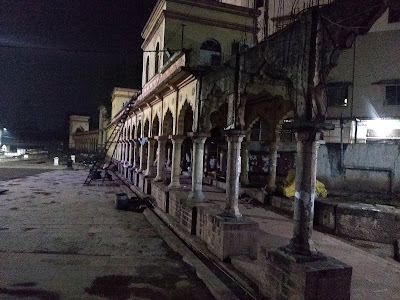 While crossing the bridge over the Indrayani we were caught by the sight of the sprawling and empty ghats and decided to halt for a while. 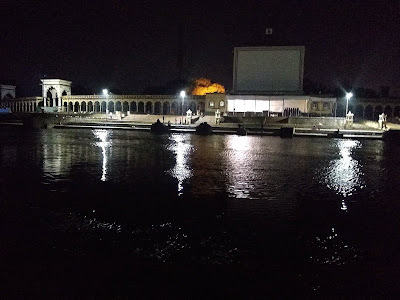 The visual delight of the ghats under lights quickly transformed to a more musical one with each step we took - for the sound of frenetic pakhavaj (a type of mridang) was heard. 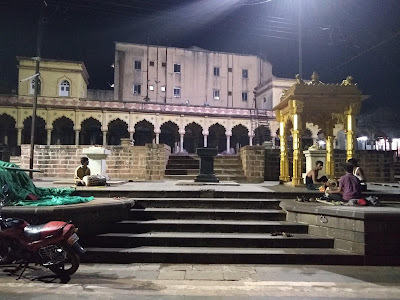 Our initial assumption was a night-long bhajan session in one of the many temples - something not altogether uncommon. But then as we approached the ghats, what we saw was a rather simple activity, but made altogether brilliant due to the numbers. 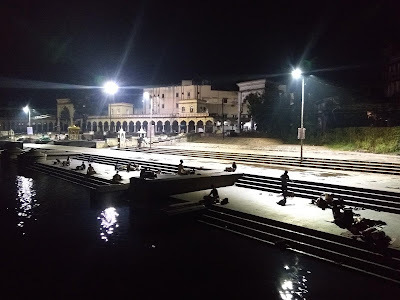 On the ghats, on both the banks of the river, were people - school age kids mostly, but also a handful of adults - playing pakhavaj with individual rhythms. Some were playing solo while some others were playing in groups of two to four people. The number of individual rhythms gave rise to an astounding crescendo with an innate undulating ebb and flow. 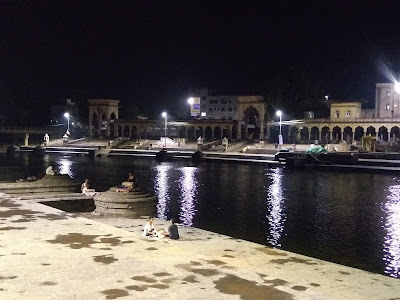 Add to that the general quietness of the ghats at night and it was just so much fun to be there. We spent quite some time enjoying the music, but then the phenomenon seemed a bit strange and I headed off to inquire. I spoke to a guy who had taken a break from the strumming. As a sign of someone who does this almost everyday, he was quite dismissive at first. It turns out he, like all the others, was a student at one of the many traditional music schools in the town. The students practice their skills almost every night of the dry season after completing their chores and after the ghats are empty. They practice till some time beyond midnight - and then wake up at four to start their day and new lessons. Quite a bit of work! It seemed that the practice session would wind down a little after midnight. However, people did keep joining in. After some time we decided to leave and then were suddenly greeted with the onset of rain. While it was just a quick dash to the car for us, the students had to scramble to get the pakhavaj covered and to a dry location. The music of the pakhavaj ended abruptly, giving way to the new music of rain. Getting to Alandi is easy due to the proximity to Pune. Alandi is a part of the Pune Metropolitan Region and is serviced by PMPML buses from other parts of the city. Pune station itself is only an hour's drive away.